5th Generation Water/Rock type Pokémon. Pokédex Entry: Incredible jaw strength enables them to chew up steel beams and rocks along with their prey. One of the best designed Pokemon from B/W imo. Awesome job capturing the details! Dude, your style is so PERFECT for Pokemon. Like, it's not over-the-top to where they stop looking like their original design, but they're also not so much like the original that they're boring. I LOVE what you've made here. This looks amazing! I can't even describe it, you just did a fantastic job with everything. I love Carracosta so much, he's definitely one of my favorite Pokemon from Gen V. I'm training mine right now, he's kickass! I wish I could make art like that. One of the few Gen V Pokemon whose english name outmatches the Japanese one in badassery. Which is even harder than usual with this one. That, and, your art is PERFECT. how amazing! nice pose and details! I want an Abagoora. I picked Archeos over it, though I like both. seems to show how powerful this pokemon is. The shading is great as always. 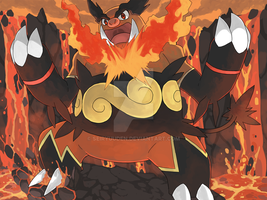 awesomeness i love carracosta he is definitely one of my top fav on the 5th gen pokemon. It's good. But it seems too dark to see the main attraction. I love the 5th Generation Fossil Pokemon. I think I say something like this with each Pokemon picture you make. Tirtouga and Carracosta are some of my favorites from the 5th gen. Great job with this one. Hey, you have the exact icon as me! Wow... I love how you've portrayed it! Very ancient looking surroundings and I love the darkness of him. Well done! haha, traidor ka daw sabi ni blastoise. Wehehehe. hahahaha SORI BLASTOISE!!! kuya matulog kana!!! katakot talaga nangyari sa japan.. grabe lubog talaga ngayon..
huhu can't think of anything to draw ngayon. dami din kasi ako ginagawa.. huhu.